1 Respiratory Care Technology Most people take breathing for granted. It is second nature an involuntary reflex. However, for thousands of individuals who suffer from breathing problems, each breath is a major accomplishment. 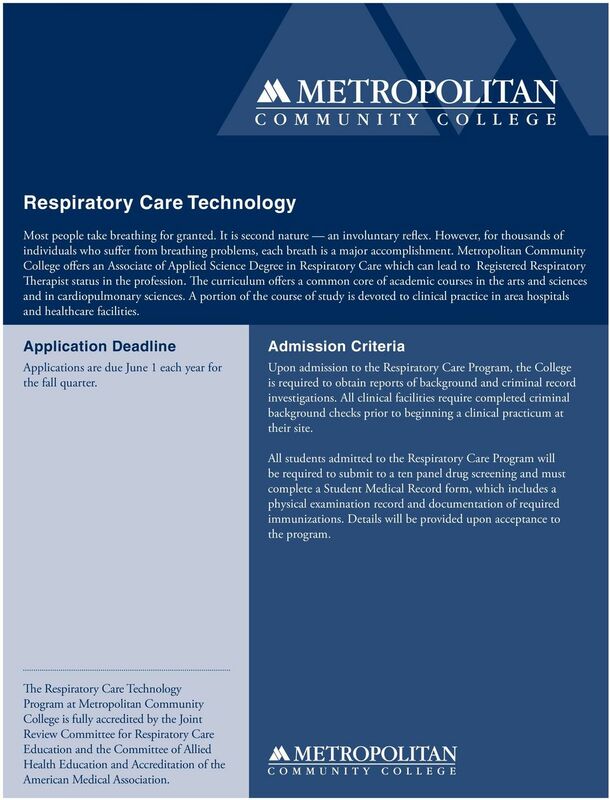 Metropolitan Community College offers an Associate of Applied Science Degree in Respiratory Care which can lead to Registered Respiratory Therapist status in the profession. The curriculum offers a common core of academic courses in the arts and sciences and in cardiopulmonary sciences. A portion of the course of study is devoted to clinical practice in area hospitals and healthcare facilities. Application Deadline Applications are due June 1 each year for the fall quarter. Admission Criteria Upon admission to the Respiratory Care Program, the College is required to obtain reports of background and criminal record investigations. All clinical facilities require completed criminal background checks prior to beginning a clinical practicum at their site. 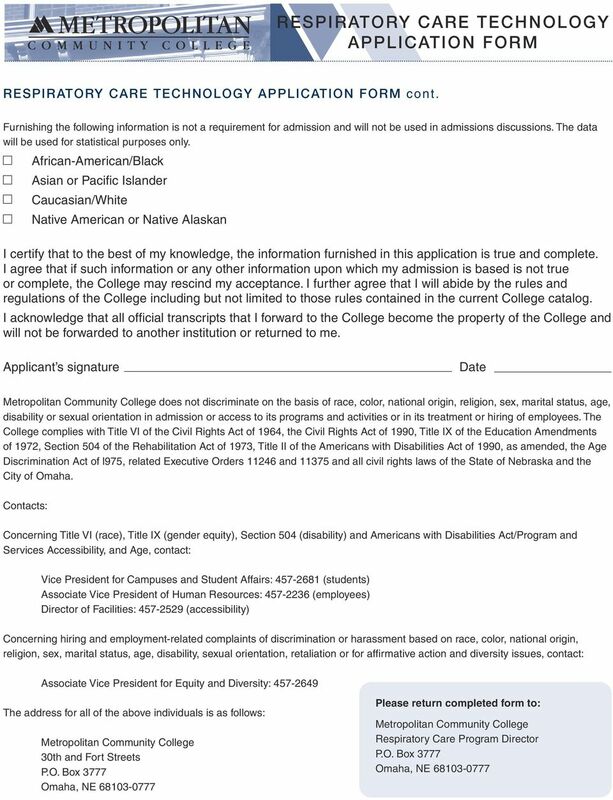 All students admitted to the Respiratory Care Program will be required to submit to a ten panel drug screening and must complete a Student Medical Record form, which includes a physical examination record and documentation of required immunizations. Details will be provided upon acceptance to the program. The Respiratory Care Technology Program at Metropolitan Community College is fully accredited by the Joint Review Committee for Respiratory Care Education and the Committee of Allied Health Education and Accreditation of the American Medical Association. 2 Requirements GENERAL EDUCATION REQUIREMENTS ENGL 1010 English Composition I 4.5 ENGL 1020 English Composition II 4.5 PYSC 1010 Introduction to Psychology 4.5 MATH 1310 Intermediate Algebra 4.5 BIOS 2150 Microbiology * 6.0 HRML 1010 Human Relations Skills 4.5 INFO 1001 Information Systems and Literacy Credit Hrs The General Education requirement for this degree program exceeds the minimum standard number of hours. For more information contact Student Services. *Additional prerequisite(s) may be required. 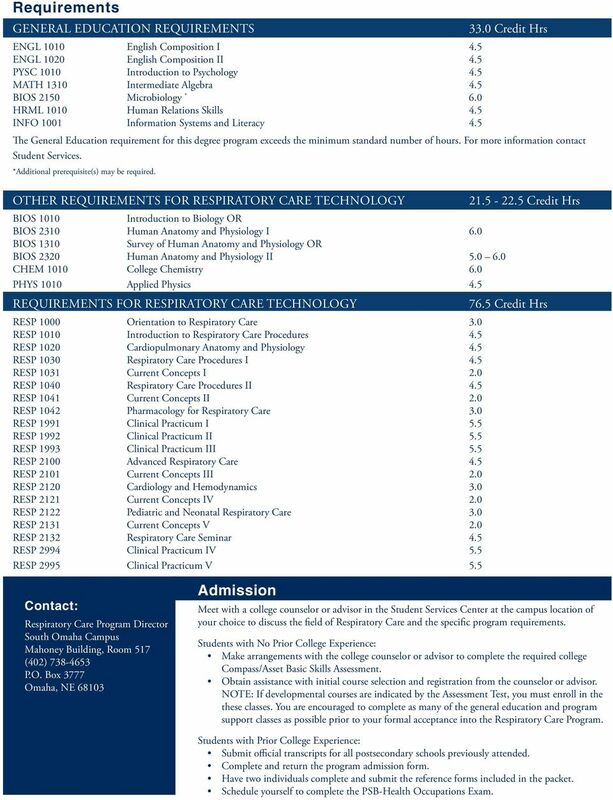 OTHER REQUIREMENTS FOR RESPIRATORY CARE TECHNOLOGY Credit Hrs BIOS 1010 Introduction to Biology OR BIOS 2310 Human Anatomy and Physiology I 6.0 BIOS 1310 Survey of Human Anatomy and Physiology OR BIOS 2320 Human Anatomy and Physiology II CHEM 1010 College Chemistry 6.0 PHYS 1010 Applied Physics 4.5 MAJOR REQUIREMENTS FOR RESPIRATORY CARE TECHNOLOGY RESP 1000 Orientation to Respiratory Care 3.0 RESP 1010 Introduction to Respiratory Care Procedures 4.5 RESP 1020 Cardiopulmonary Anatomy and Physiology 4.5 RESP 1030 Respiratory Care Procedures I 4.5 RESP 1031 Current Concepts I 2.0 RESP 1040 Respiratory Care Procedures II 4.5 RESP 1041 Current Concepts II 2.0 RESP 1042 Pharmacology for Respiratory Care 3.0 RESP 1991 Clinical Practicum I 5.5 RESP 1992 Clinical Practicum II 5.5 RESP 1993 Clinical Practicum III 5.5 RESP 2100 Advanced Respiratory Care 4.5 RESP 2101 Current Concepts III 2.0 RESP 2120 Cardiology and Hemodynamics 3.0 RESP 2121 Current Concepts IV 2.0 RESP 2122 Pediatric and Neonatal Respiratory Care 3.0 RESP 2131 Current Concepts V 2.0 RESP 2132 Respiratory Care Seminar 4.5 RESP 2994 Clinical Practicum IV 5.5 RESP 2995 Clinical Practicum V Credit Hrs Contact: Respiratory Care Program Director South Omaha Campus Mahoney Building, Room 517 (402) P.O. Box 3777 Omaha, NE Admission Meet with a college counselor or advisor in the Student Services Center at the campus location of your choice to discuss the field of Respiratory Care and the specific program requirements. 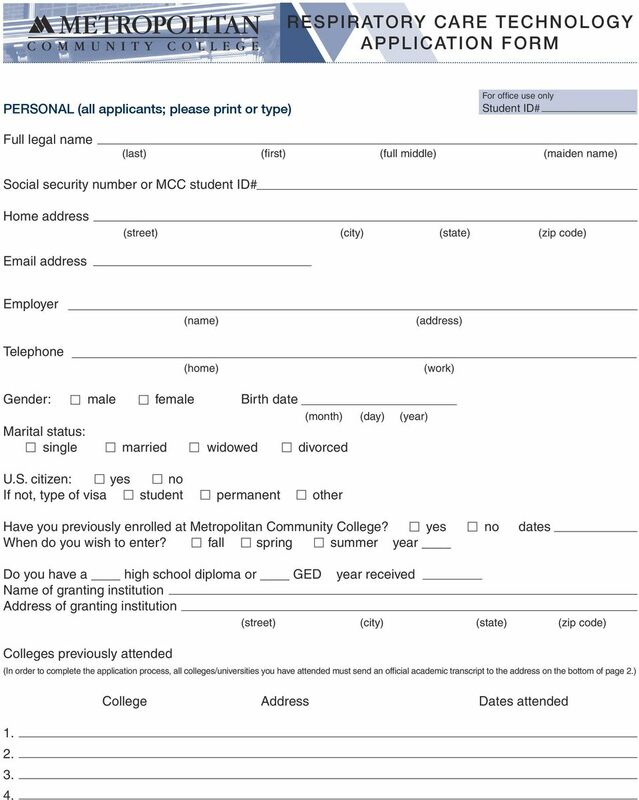 Students with No Prior College Experience: Make arrangements with the college counselor or advisor to complete the required college Compass/Asset Basic Skills Assessment. Obtain assistance with initial course selection and registration from the counselor or advisor. NOTE: If developmental courses are indicated by the Assessment Test, you must enroll in the these classes. You are encouraged to complete as many of the general education and program support classes as possible prior to your formal acceptance into the Respiratory Care Program. 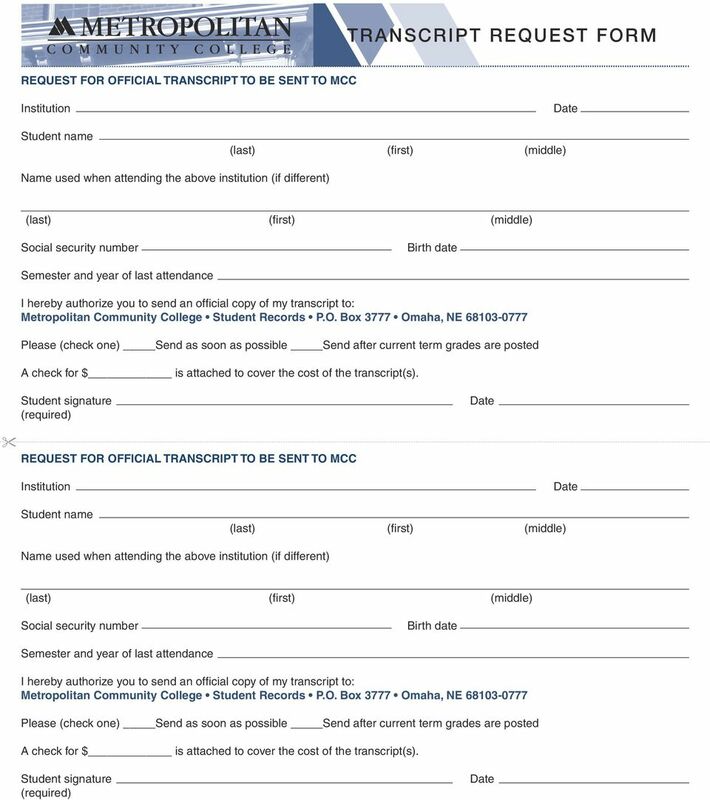 Students with Prior College Experience: Submit official transcripts for all postsecondary schools previously attended. 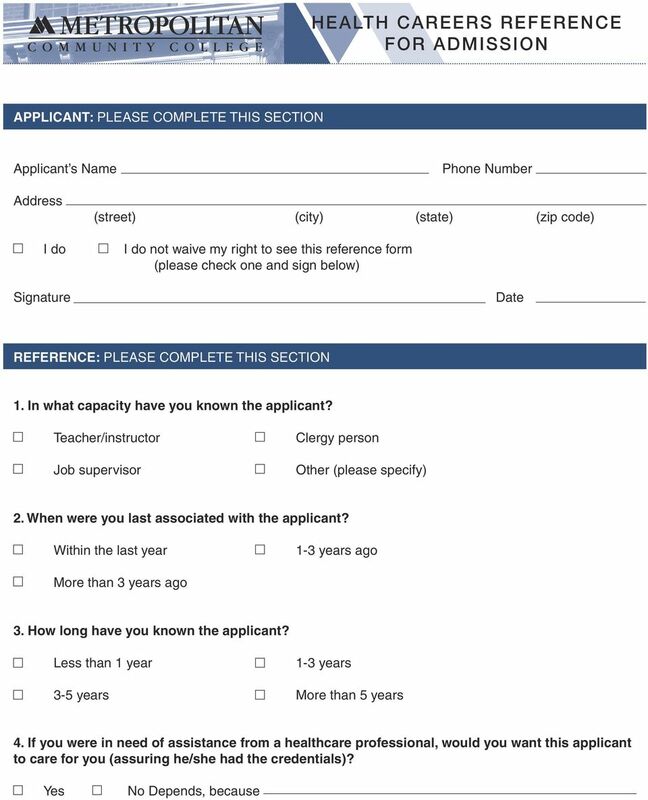 Complete and return the program admission form. 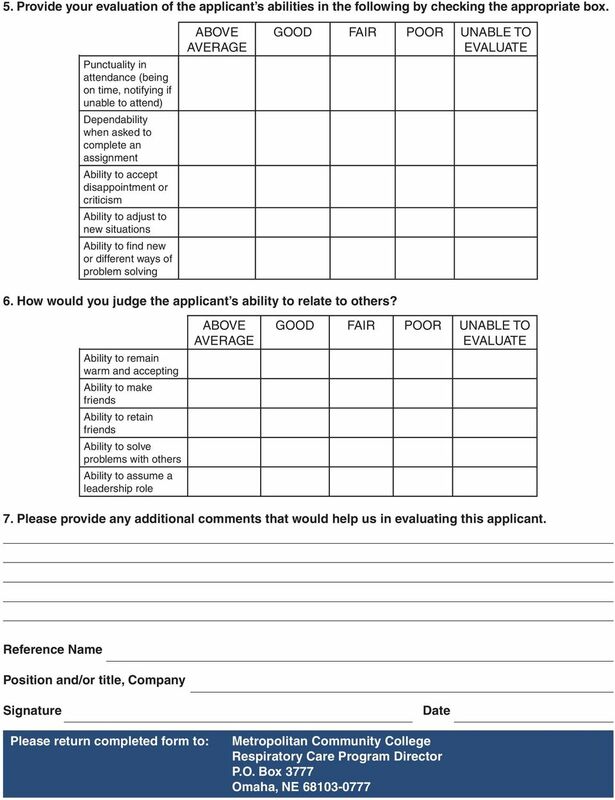 Have two individuals complete and submit the reference forms included in the packet. Schedule yourself to complete the PSB-Health Occupations Exam. Application for Admission prog code/major start term FOR OFFICIAL USE ONLY There is no application fee. Please print (use dark ink). Please mail to the Main Campus. 1. Name Last First Middle Maiden 2.